High Energy Conversion solar charger - high efficient solar cell panel convert up to 22%-25% of solar power into free energy. Charge up to two USB devices simultaneously and forget what it feels like to have to look for a socket. Powerful LED & Flashlight SOS - the LED flashlight of solar power bank works perfectly in darkness,especially for emergency.Just press the button on the charger for 3 seconds,the LED will light up;5 LED status of charge indicators indicate the charging and discharging process. 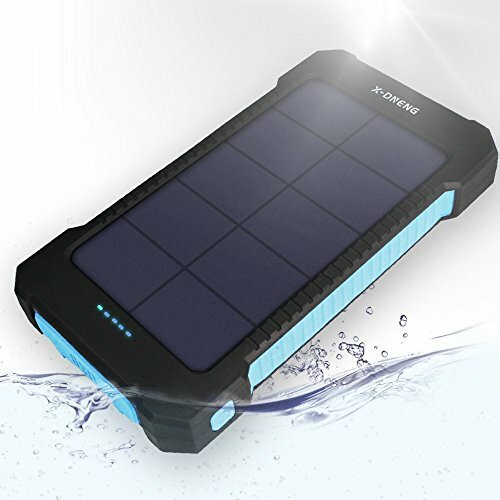 Water-Resistant and Incredibly Durable - smart IC circuit with waterproof treatment and environmental protective silicone shell,the solar cellphone charger made from ABS+PC material which is fire resistant.This solar power bank is perfect for hiking,traveling,camping and any where you have direct sunlight. Dual USB Smart Charging Technology - the smart IC chip of the solar panel intelligently identifies your device,and maximizes its charging speed while protects your devices from over charging and overloading.The charging current of USB ports is monitored and automatically adjusted according to the sunlight level. High Capacity External Battery Backup - 10000mAh capacity integrated Li-polymer battery,this solar powered phone charger could charge itself under the sunshine.Please do not take solar as primary charge source,as a backup emergency power bank,solar is mainly for topping off the unit.